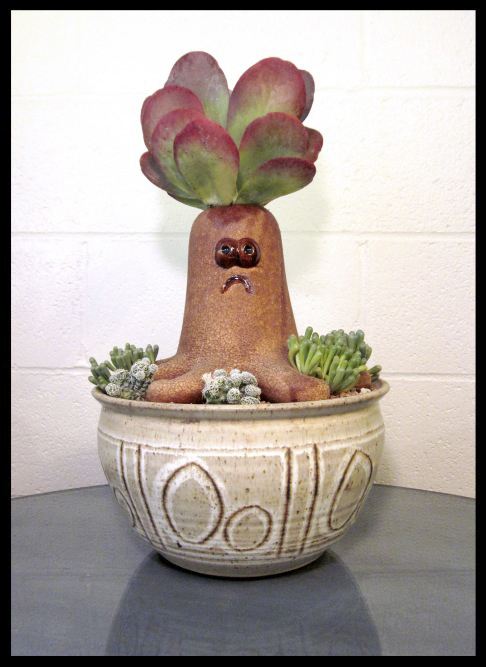 **Sigh** Rancho’s entry in the Potted store planted container contest failed to place in the semi-finals. But, it’s okay, because as with most sad situations there are upsides, and lessons were learned. Upside no. 1: Cheating Teddy bears were exposed and booted from the contest before any real damage could be done. Other than psychic, that is. Upside no. 2: We now know who our friends are … and, even though we acknowledge that the number of friends we thought we had is waaaaaaaaaaay lower than previously estimated, we love those who voted faithfully. Or, at least said they did. Upside no. 3: We have a photographic record of our beloved FIRESTARTER, which is handy as Frito and Inky saw fit to climb up on the dining room table and destroy it! Why I didn’t see that as the bad omen it clearly was, I’ll never know. Downside no. 1: Having to come to grips with my apparent competitive streak, which at this moment is preventing me from ‘moving on’, or whatever that is my therapist pal might say I should do. Downside no. 2: Recognizing that I’m a snob … which explains my hating-on probably perfectly nice people just because they would use down-market beer cans as plant containers. Downside no. 3: Regret. Why, gawd, why, did I not follow my own heart and enter the OCTOPUS’S GARDEN in the contest? Clearly goofball whimsy and the ability to appeal to a yet-unnamed itchy-to-vote-for-something-cute demographic would’ve at least landed us in the semi-finals! So. To place your vote for one of the final 10 semi-finalists, click this link. I’m casting my single vote for no. 7, the bank of apartment building mailboxes-turned-planters by Jay Burns. I love the combination of the mailbox’s industrial utilitarianism played against the Tim Burton-esque cacti … extra points for the chubby frog trumpeter! And, with this, we’re out! You are hilarious. One question — how in the world do two tiny Chihuahuas get onto your dining table? Well, Dave, with lightning speed they leap onto the chairs, then right up onto the tabletop … they’re amazingly quick and agile! I looked at the semi finalists today and didn’t even bother to vote. Too depressing. Really? That’s the best they could come up with? I don’t get it. Had I voted it would have been for the one you recommend (the mailboxes) but even that pales in comparison to your creation and a few others that I voted for over the weeks. People are crazy! I have a feeling we weren’t the only ones surprised by some of the entrants! Honestly, and please forgive me if this offends anyone, no offense intended to the fine people at Potted or anyone else–these contests are not meant to recognize creativity, originality, and beauty–they are meant to drive people to a particular website via Facebook. That Is All. Your loss inspired a thoughtful post– maybe that is better than winning? The octopus is very cute, but I thought Firestarter was waaaaay cooler. As the organizer of the occasional contest myself, it’s always interesting to see who participates … and there are always surprises! I wanna hear the dirt on the cheating teddy bear! Who? How? Where? And by all that is holy, why? Details were sketchy … I’m thinking the Cabbage Patch Kids were using an illegal algorithm and thereby voting every 18 minutes on the hour … Teddy Bears: ruthless forest creatures forced to endure the moist hugs of children for eons! So glad Firestarter was documented on film. Reuben, that contest cramped your amazing style. Potted needs to do the decent and acknowledge your submission in a separate category (like the “heads and shoulders above everyone else” category). I liked the mailboxes out of the last round and gave them the final vote. Contests always send me back to spelling bee’s in grade school, which I hated. If you can’t spell, you’re jeered, if you can spell, you’re considered a geek. Yes, I was/am a geek. Geeks unite! … I admit I was always proud of my spelling prowess … sadly, Spanish class bees were my undoing: to this day my pronunciation is sub-par! You’re welcome! Thanks for coming by … I hope you get to go shoppIng! I’m sad you lost. Firestarter was great, and I really don’t get what was going on with the beer cans. Tragic. I just noticed the poor, sad octopus. This octopus has seen too much, too soon. Please give him/her/it a hug for me. Just turrbul. WTH, Firestarter is clearly the winner in my book. Pouting right along with you. Which is what I should’ve gone for: cute! Ditto on all of the above! How about having a RR “potted” contest? You wouldn’t be able to enter, of course, but you could reclaim your right to well deserved “snobbishnes” by hosting a “better” version. We, your admiring followers, could each send a little something cool to add to the prize mix(a piece of art, a plant, a pot, a baby’s arm holding an apple?)! Mine didn’t make the finals either. And I agree about the beer cans!